When do you offer smoking cessation counseling in your program? AM/CCT: Smoking cessation is discussed at the point of care when the LCS exam is ordered. Educational materials for smoking cessation counseling are developed during office visits (see Resource Section). Smoking cessation is reinforced at multiple additional time points through program navigators and CT technologists. CL: Smoking cessation counseling is provided at the SDM visit prior to ordering the LCS CT. For a new patient, pulmonary function studies will be ordered if not previously performed to provide an opportunity to optimize overall lung health and establish a diagnosis of COPD if not previously assessed. DTC: Smoking cessation resources and access to the Living Tobacco-Free Smoking Cessation Program are made available through the screening process. CF: Whenever the opportunity presents! At visits with PCP, all patients actively smoking will be referred to pulmonary. What are ways to promote clinician intervention through education, resources and feedback? ABK/AR: Although the optimal strategy for delivering smoking cessation advice and intervention in an LCS setting is unknown at this time, prior research suggests that integrating smoking cessation into LCS programs represents a teachable moment for smoking behavior change. Screening provides multiple opportunities to personalize the health risks of persistent smoking. Smoking cessation is part of the shared decision-making discussion and resources for smoking cessation can be provided at the SDM discussion, at screening site at the time of the scan, in the appointment confirmation patient letter, with the patient results letter and with patient appointment reminder letters. Physicians have teachable moments at the SDM discussion and when discussing scan results regardless of the result. Point prevalence quit rate 20.8 percent (141/678). Annualized rate 14.5 percent vs. 5 percent general population. Relapse rates 10 to 20 percentage points lower than the general population. Quitting smoking improves the prognosis of cancer patients. All-cause and cancer-specific mortality is improved by smoking cessation. Smoking cessation decreases risk of secondary malignancies. 36 percent risk reduction in cardiac mortality associated with smoking cessation (Critchley et al. 2003). Patient reports during SDM discussion with healthcare provider, captured in LCS exam order and in patient medical record: packs/cigarettes per day, years smoked and years quit if former smoker. We also capture other tobacco use, including cigars, pipe, snuff, hookah and other. Patient reports to lung cancer exam scheduler and reported in the LCS database: packs/cigarettes per day, years smoked and years quit if former smoker. We also capture other tobacco use: cigars, pipe, snuff, hookah and other. Patient is asked about current smoking status at every screening exam by CT scan technologist and data entered into PACS. There is an algorithm to mine data from EHR. How do you track that smoking cessation was provided in your program? Document in LCS relational database. number of individuals screened for tobacco use (numerator). number of individuals who present to an LCS program screening site (denominator). Tobacco use treatment provided or offered at the time of LCS. The number of individuals who received and refused practical counseling to quit (numerators). The number of individuals who received and refused FDA-approved cessation medications (numerators). The number of individuals identified as current tobacco users (denominator). Tobacco use assessment annually, at each LCS appointment. Reassessment of smoking cessation at the time of annual repeat LCS. Reassessment of smoking status at the time of follow-up of positive study. MG: Robust options for TST include phone-based and web-based instruction, as well as in-person classes. What resources are available for physicians to help patients quit smoking? Ask each patient about tobacco use. 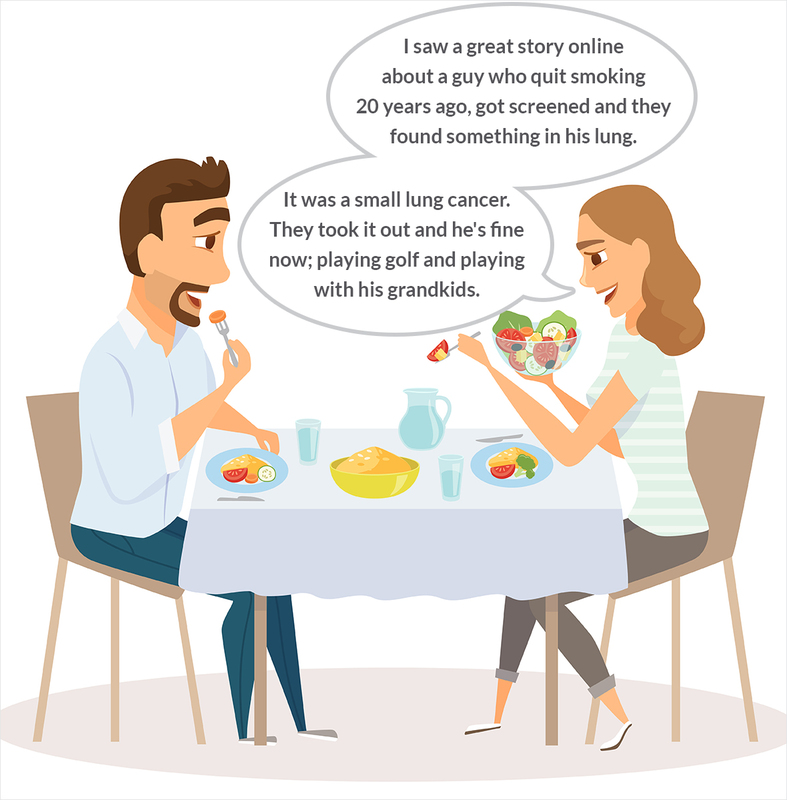 American Lung Association series of robust resources available nationwide, providing information and resources about quitting available at: http://www.lung.org/stop-smoking/how-to-quit/. Mindfulness smoking cessation program based on a successful program developed at Yale—web and app based https://www.cravingtoquit.com. National organizations and websites52–55 are included in the resource section. What are ways to dedicate staff and/or resources to providing smoking cessation treatment and follow-up for people in LCS programs? How do you incorporate smoking cessation support in the screening program? Send all current smokers smoking cessation resource lists with patient letters. LCS program navigator/coordinator calls all current smokers in the program and discusses smoking cessation options. Navigator or other provider conducts smoking cessation counseling with all smokers. Hospital/medical center smoking cessation program manager contacts all current smokers in the screening program to discuss smoking cessation options. American Lung Association Freedom from Smoking® group clinics. ABK: Patient reports during SDM discussion with healthcare provider, captured in LCS exam order and in patient medical record: packs/cigarettes per day, years smoked and years quit if former smoker. We also capture other tobacco use, including cigars, pipe, snuff, hookah and other. More than 90% of regular smokers start by age of 18; 99% by age 26. Three out of four teen smokers become adult smokers. Smoking is a strong addiction; it is harder to quit smoking than heroin. The tobacco industry spends $8.4 billion a year on advertising tobacco products, much of it targeted at our youth. Once addicted at a young age, when judgment has not yet matured, many find it very difficult to quit and suffer through a lifetime of addiction. Although smoking is a risk factor for many other cancers and other diseases, lung cancer is most closely associated with smoking since more than 80% of lung cancers are caused by tobacco use. This results in stigmatizing people with lung cancer. 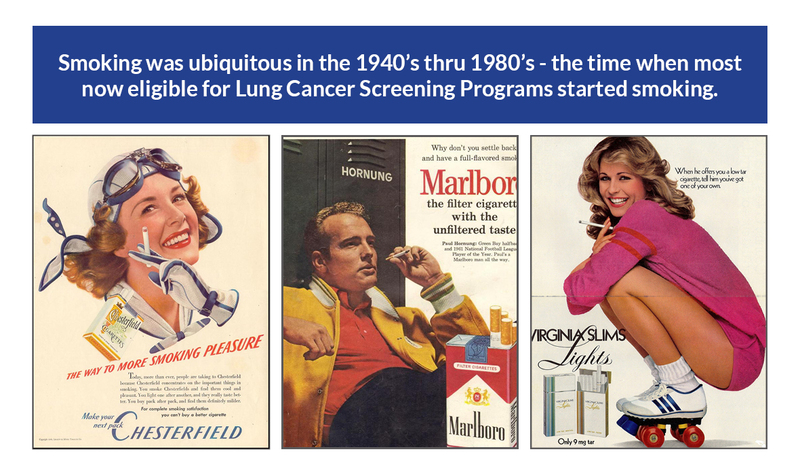 Many, who are eligible for lung cancer screening, especially current smokers, may be reluctant to get screened for fear of being stigmatized, especially by younger physicians that were not alive when smoking was ubiquitous. You are offered this low dose CT scan since you either smoked or still smoke in excess of about a pack of cigarettes a day for the equivalent of 30 years. The CT scan has been shown in a large, well done trial to significantly reduce lung cancer death. For the two-year interval of screening, the magnitude of reduction in lung cancer death for lung cancer screening was 20%. For the majority of screened subjects this process will involve an annual CT scan that takes less than a minute. In the first year of this process, we expect to find lung cancer in one out of 100 people who are scanned and a smaller number in subsequent years of screening. Some people (about 25%) may require a follow up scan or other imaging procedure and a small fraction may require a surgical process to biopsy a suspicious nodule that was detected on the CT. 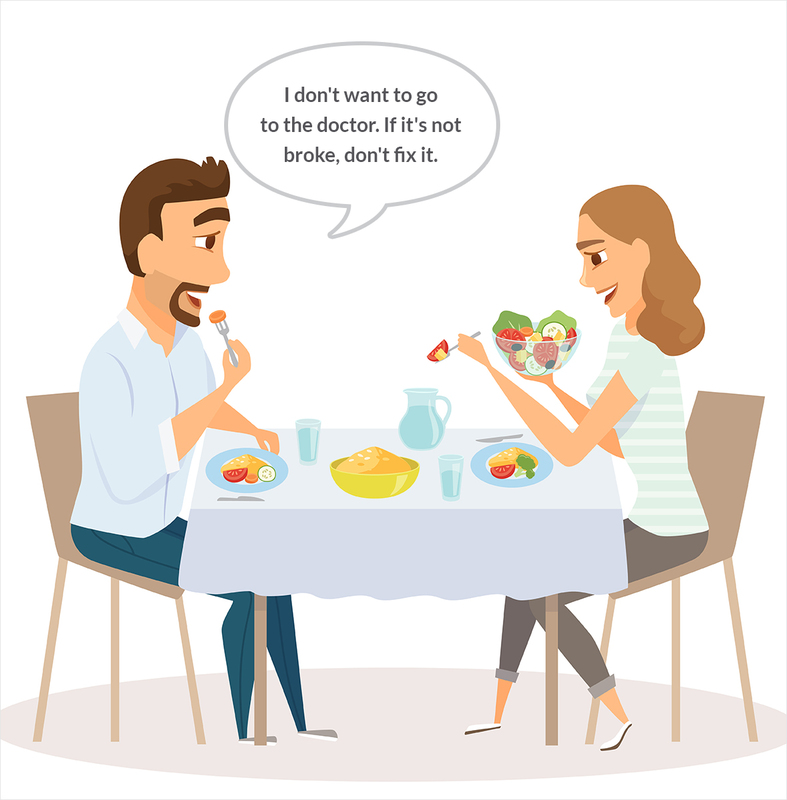 The complication rates with these types of procedures are infrequent and rarely life-threatening but your clinicians will discuss these issues in greater detail if that situation arises. Most nodules that are found will not turn out to be cancer; about 95% of nodules found through screening are false alarms. Lung cancer screening is a process to find earlier, more curable disease and so if a cancer is found in the screening process, your doctors will recommend that the cancer is removed, typically by a surgical process. If you are not comfortable with such an approach, please discuss it with your doctor carefully, as lung cancer screening may not be appropriate for you in your setting. It is worth noting that today’s lung cancer surgery can be performed in a way that generally allows for rapid recovery and return to full activity. Lung cancer cure rates in this setting are high, but due to your long exposure to tobacco smoke, additional new lung cancers can develop and so continued annual CT screening is recommended. There are other issues to discuss but the message has to accurate, informative but measured. The current litany including medical radiation harm—overdone (how much time do you and your dentist spend on this topic? ); over-diagnosis—if using current staging approaches and conservative surgery for GGOs, then this number is a low single digit number—which is by far the lowest number for any cancer screening service; length bias; lead-time bias—these factors have been addressed by the evidence from the NLST and need not be discussed with a new screening subject. Forty percent of the invited participants with the recent VA pilot declined participation. The USPSTF-recommended lung cancer screening after an expensive trial of 53,000 participants. CMS added requirements for an informed decision process with no objective evidence of benefit in a situation where there was not objective evidence of harm associated with the relevant current informed consent process. In fact, CMS reimbursement for the unvalidated informed decision making process is greater than the reimbursement of the technical component of the scanning. Our fiduciary responsibility is to a patient, with the kind of screening services available at Lahey Clinic, Cleveland Clinic, Christiana Care, etc., I strongly believe that a heavy smoker fitting current NCD criteria that is otherwise fit, will benefit from participation in a screening process —especially with the proactive provision of best practice tobacco cessation. To have forty percent of subjects refuse such a service bespeaks an implementation problem and we should consider if that is an isolated problem or a more system problem for lung cancer screening implementation.